EI 30 class wooden window – Fire and Rescue Department under the Ministry of the Interior of the Republic of Lithuania Fire Research Center, according to the standard BS EN 13501-2: 2008 + A1: 2010, given the fire resistance class – E30/EI130/EI230/EW30, window fire resistant from the external side of the product at least 30 minutes. PAS 24 window – approved by tests in the laboratory in Birmingham, sertified, safe wooden window for the Britich market. PAS 24 is an optimal security – guarantees high product safety standards in the event of break-in or vandalism, also protects against accidental blow. Do you live near to a busy road, close to an airport or a railway? Do you appreciate peace? The amount of noice in the building depends on the sounds insulation properties of the window. We offer you windows with 38 dB and 44 dB sound insulation, which will allow you to enjoy silence. The airbone sound reduction index for these windows were determined using precision integrated noise spectra meter, positional microphone and loudspeaker during tests in the laboratory of building physics of the Institute of Architecture and Construction of KTU in accordance with the standard of LST EN ISO 717-1: 2013. 44 dB means that the traffic noise (intensive highway or construction), which is harmful, ca be reduced to a comfortable level of 38-44 dB. Why A+ class windows are so special? 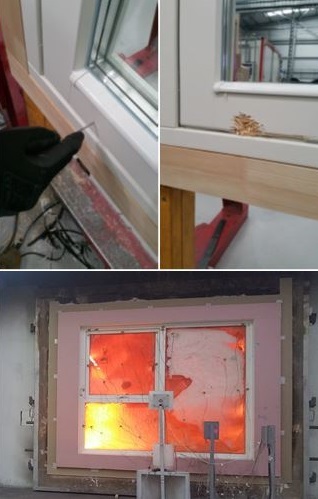 Thermal conductivity is a very important parameter in assessing the quality of a window. The energy efficiency of the windows is expressed by heat transfer coefficient Uw, calculated according to the method specified in ISO 10077-2. From the 1st of January 2018 there is a request that the newly built houses should meet not lower than A +, and from year 2021 – A ++ energy efficiency class requirements. When building A + class houses that are in need of less energy or particularly passive houses, it is especially important to choose high-quality windows, as their area forms a fairly large part of the entire exterior wall of the building. It is through windows that most of the heat is lost, losses can reach up to 50%. At present, the categorization of windows according to energy performance classes is a voluntary process, and its marking, which defines the amount of energy savings, is similar to that often seen on household appliances. The worst-case windows with a Uw of 1.5 W / m2K and above are classified as class G, while the most energy-efficient windows with Uw up to 0.78 W / m2K are classified as A ++. “Sumeda” can offer you both – A + and A ++ class high quality, heat-resistant and energy-saving windows !!! Remember – windows with extremely high energy-efficiency properties save energy for heating your home, making it a long-term investment in your future! To find out more, contact our experienced project managers and get professional advice !! !